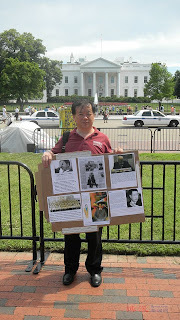 1989 Chinese student leader Liu Gang was spotted outside of the White House with a home-made protesting poster yesterday. He was calling on the US government to act on what he termed as the "unrestricted warfare" conducted by the Chinese government on American soil. Liu Gang has been embroiled in a nasty divorce after his second marriage fell apart. 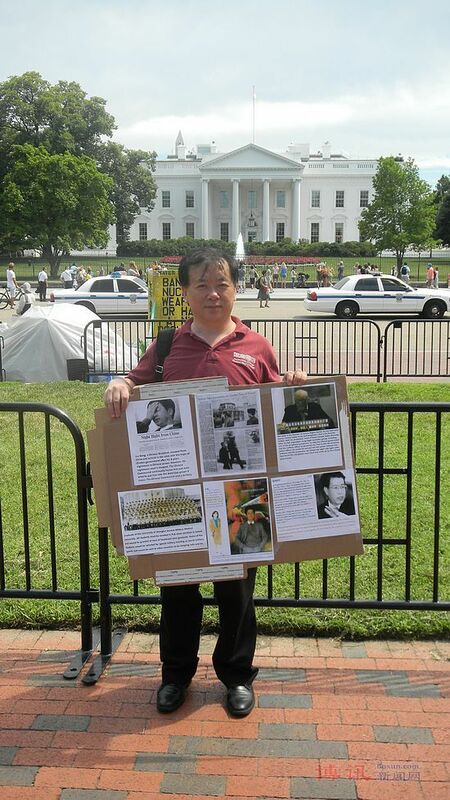 He publicly accused his estranged wife as a former Chinese military officer and that the Chinese government has launched a para-military campaign against him, his now-former employer, and other Chinese dissidents and American dignitaries. Almost a year ago, he sued Chinese president Hu Jintao in a New York court with similar accusations. Liu Gang also claims that he was the initiator of the so-called "Jasmine Revolution" in China and that it made him a target of the Chinese government. His public accusations of his wife and his former employer have led to him losing his job and being temporarily arrested a few times. But he has vowed to defy a court-ordered gag order and continue to protest his case in public. This morning, he declared he will travel around the country with his personal protests. He did not disclose details of his plan.